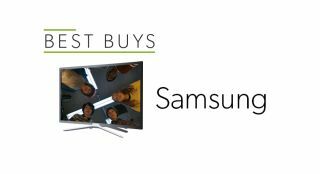 Best Samsung TVs 2018 - Full HD, 4K HDR, QLED | What Hi-Fi? From a 32in screen for less than £300 to a 65in QLED monster for over three grand, the Korean giant has a TV for you. Here are the best Samsung TVs to pass through our test rooms in recent months from Full HD to 4K HDR. If you're looking for a second or third TV and it doesn't have to be a mammoth 65in set, this 32in Full HD model could be the perfect fit. What it lacks in bells and whistles it makes up for with a stoic performance. A startling level of performance (and screen size) for the money leads inexorably to a What Hi-Fi? Award. The QE49Q7F has everything going for it: a punchy, vibrant picture, slick operating system and a screen size that OLED can't currently match. Samsung's flagship 55in QLED produces a bright, colourful picture and greater black depth and consistency than a backlit telly has achieved before. If you're looking for a serious rival to OLED, this is it. If you can accommodate Samsung's impressive 65in QLED TV you won't be disappointed. A premium set with a premium 4K HDR picture.